The happiness of your customers will make or break your business, so today I'm looking at how to use the Net Promoter Score to get to the heart of customer satisfaction in the SaaS sector. [your SaaS product] to a friend or a colleague?" Customers are asked to respond on a zero-to-ten scale, ranging from 'Not at all likely' (0) through to 'Extremely likely' (10). 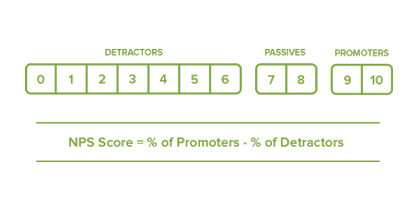 Your Net Promoter Score is then calculated by subtracting the percentage of Detractors from the percentage of Promoters. A positive score suggests that there are more people willing to recommend your product than those trying to dissuade others from using it - you're receiving a net promotion - and vice versa. The NPS helps to turn qualitiative information into something more quantiative, allowing you to measure and compare satisfaction levels over time. 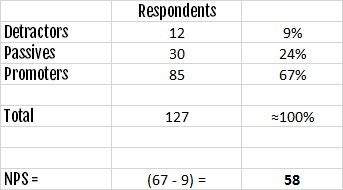 Armed with your replies, you can follow up with respondents to find out exactly why they answered the way they did. It's easy to send your customers a simple NPS survey, and with only one question, you're likely to get a response. With a simple output, it becomes easy to monitor customer satisfaction over time, and correlate changes in NPS with changes to your product and service. Customer referrals represent a huge source of potential growth, and the NPS allows you to identify the people most likely to make those referrals: your Promoters. You'll be able to find out which aspects of your product are most loved, improve your definition of an ideal customer, and even encourage Promoters to take action on their enthusiasm, and recommend your product to someone else. Upselling is another lucrative channel of growth, and the NPS makes it possible to focus your upselling efforts on the customers most likely to benefit from additional products or services. There's also a good chance that those same customers will be willing to provide testimonials and recommendations about their positive experiences with your company. Detractors are only a small step away from becoming churn statistics. The NPS allows you to identify the people most at risk of churning, and reach out to them to understand (and even remedy) their objections. There are hundreds of NPS tools available, and many of them collate customer scores and create industry-specific benchmarks from them (like Zendesk). In these cases, you'll be able to identify rough benchmarks to compare with your own NPS scores. That said, industry benchmarks are often inaccurate, irrelevant and misreported. Instead of focusing on absolute figures, your SaaS solution will be better served by focusing on how your NPS changes over time (and trying to uncover the reasons behind those changes). SaaS performance metrics shouldn't be analysed in isolation, and you'll get more benefit from NPS surveys if you use them to segment your existing data. For example, you could compare NPS across different pricing tiers, and different cohorts, and find out which pricing tier generates your most satisfied customers. You could track it alongside product development and specific feature roll-outs, and track how customer satisfaction correlates with new features and functionality. It's common practice to use email for the Net Promoter Score, but if your email open rates are only 20%, you've immediately eliminated 80% of your possible survey respondents. Thankfully, you have a killer website, and even a great app - so why not reduce friction, maximise responses, and build the survey directly into your product? Customer satisfaction changes over time, and so will your product, your service, and your customer base. There's no point measuring NPS once, and declaring victory: it needs to be measured and evaluated as frequently as possible. Finally, it's essential to actually act on the findings of your Net Promoter Scores. SaaS metrics are only as useful as your ability to use them to improve performance, so NPS surveys need to paired with personalised follow-up questions, to uncover problems that need to be fixed and successes that need to be promoted.